This soup may look delicate, but the dashi ensures that it provides a distinctly satisfying flavour. De-vein the prawns, parboil in salted water for 40-60 seconds, then remove the shells. Remove the stems of the Shiitake and trim the mangetout, then parboil them. 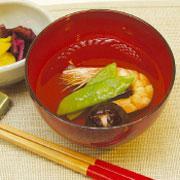 Heat up the dashi, salt and sake, add the prawns, Shiitake, and then the soy sauce. Bring to the boil then remove from the heat. Garnish with mangetout when serving.